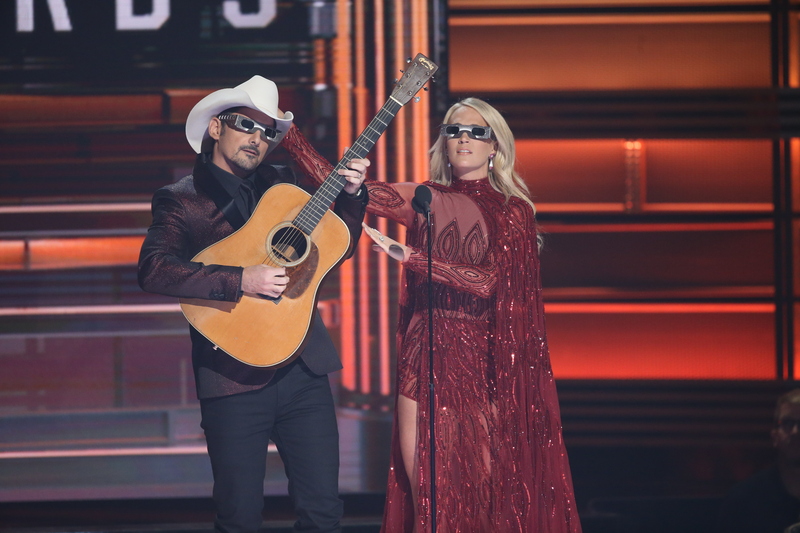 “Total Eclipse of the Garth”: Brad Paisley and Carrie Underwood keep the crowd laughing with parody tunes at The 51st Annual CMA Awards. The 51st Annual CMA Awards won the ratings race on Wednesday night, and saw an uptick from 2016. Airing live on ABC-TV from the Bridgestone Arena in Nashville, the show drew 14.29 million viewers, up from 12.5 million in 2016, and 13.6 million in 2015. (Last year’s event aired opposite Game 7 of a historic World Series). Among adults 18-49, the 2017 CMA awards drew a 3.2 rating, an increase from 2.9 in 2016. Source: The Nielsen Company, posted on Zap2it.com.